Minister Chandrani Bandara Jayasinghe addressing the gathering. Picture by Priyan de Silva. She was addressing a capacity-building workshop for local female councillors in the Southern Province titled Creating Effective Leaders, which was organised by the Strengthening Democratic Governance and Accountability Project (SDGAP) funded by the Sri Lankan Government and the United States Agency for International Development (USAID). 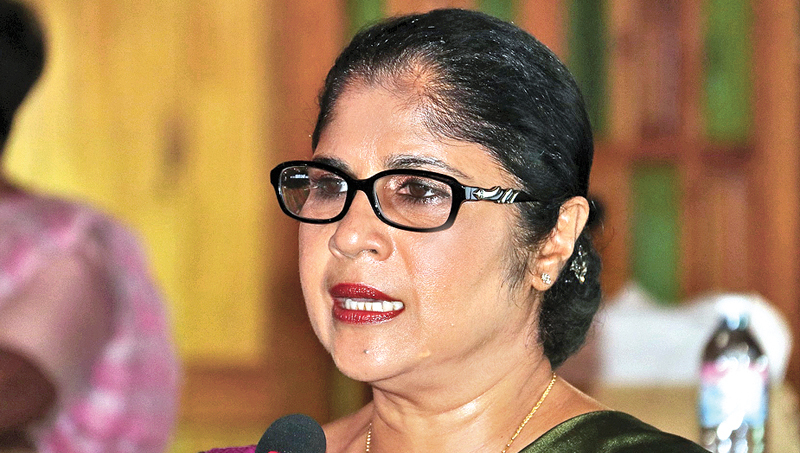 “The 25-percent female representation in local government bodies was achieved while facing many hardships, mainly due to the dedication and support extended by President Maithripala Sirisena and Prime Minister Ranil Wickremesinghe,” the minister said. She added that even though 52 percent of Sri Lanka’s population were female, males were given preference to be elected to decision-making bodies, as there was doubt whether women could play the role of a decision-maker in the political arena. She reiterated that it was a novel situation where women have been elected as decision-makers in local government institutions and all eyes would be vigilant on how those novice councillors would perform. “Even though most of you here today have been elected from the preferential list, you should strive to gain the trust of your constituents and win your wards at the next election,” she added. Addressing the gathering, Member of Parliament Sudarshani Fernandopulle said that she hoped that the 25-percent female representation would be extended to provincial councils and even Parliament. Professor Kamala Liyange, Sama Rajakaruna, Indika Dayarathna, Ajith Kaluarachchi and Kumari Vitharana were among the panel of resource persons who had been invited to the workshop.